The definition of raku firing (American-style) is “a firing process in which work is removed from the kiln at bright red heat and subjected to post-firing reduction (or smoking) by placing in containers of combustible materials, which blackens raw clay and creates cracks in glaze.” But as with anything in ceramics, there is not just one way to make raku fired pottery. Naked raku is a variation of the raku technique in which a slip is applied to the pot before it is placed in the raku kiln. 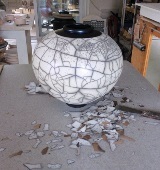 The slip cracks and breaks apart during the firing and is chipped off after to reveal a blackened crackle pattern. Kate and Will Jacobson figured out a way to add some color and drawn imagery in the naked raku technique. In this post, the Jacobsons share how they make their colorful raku fired pottery. – Jennifer Poellot Harnetty, editor. Although we have lived in many different places and experimented at length with materials, our approach to the naked raku technique is basically the same as it was 25 years ago. We like to throw thin-walled pots with cone 10 Laguna clays (Amador and WSO). When the pots are leather hard, we apply a thin layer of colored clays (Figure1). Most of these are colored porcelain, but we also use some white stoneware and earthenware. The colored clays are first brushed on and allowed to dry for 10–15 minutes (Figure 2). By using the color clays “watered down” you can get the color underneath to show through when burnished. Once the colored clays have dried, they can be burnished. The first burnish is just to smooth the clay out. Care is taken to fill in any divots or rough spots. 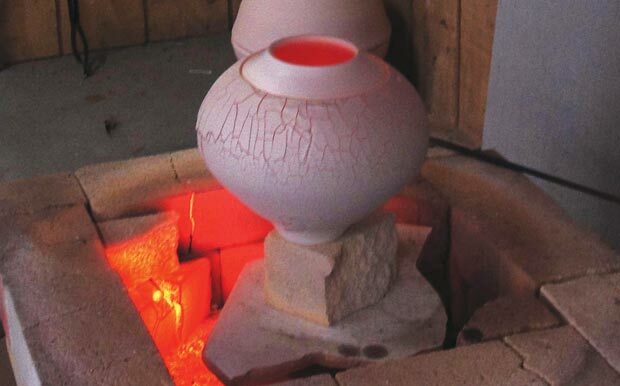 We then let the pot sit for 1–4 hours to dry further, then burnish at least once more to get a glossy surface. To retain this gloss, the pots need to dry slowly for 1–2 days. Kate and Will Jacobson join other pioneers in the naked clay movement with their innovative alternative firing techniques. Discover how to get a variety of effects with raku and pit firing in Naked Raku and Related Bare Clay Techniques. We then bisque fire the pot to about 1427°F (775°C). We find there is a fairly wide temperature variation, 122°–158°F (50°–70°C), that can be acceptable to us for our clay body & style of work. After the bisque, we apply the resist slip and glaze combination that gives naked raku its special look (Figure 3). For the resist slip, we brush on a thin layer of our Amador throwing clay. It holds on to the pot very well throughout the process and comes off with ease after reduction. We have experimented with making the resist slip from lots of different stoneware clays with excellent results. Be sure that the pot does not feel too “cool” to the touch before glazing. We use the 65% Ferro frit 3110/35% Gertsley borate glaze we developed in 1985. We have used other raku glazes and experimented with the percentages and variations of frits and borates in the glaze, but have not found one that works better than the original formula. The raku glaze is poured on to the pots and may be brushed on to smaller pieces or sculptural work. As the glaze has a lot of Gerstley borate, it quickly begins to set up or thicken within 30–45 seconds after it has been stirred. So, time is of the essence in getting it to pour well. We suggest you try two or three different thicknesses until you get a feel for what each layer will do in the fire. Generally, the thinner layers will have tighter, smaller crackle lines than a glaze that was put on slightly thicker. If you go thick, the crackles will be very large and spaced far apart. Thick glaze also can fire out with dots and shadowy areas with very little crackles. There is simply no substitute for firing a lot of pots through to get a feel for the slip/glaze relationship when learning the naked raku technique. After the glaze has dried for a few minutes, you can then etch drawings through the slip/glaze layer. We use a wooden tool with a sharpened point. This is done gently so as not to scratch the surface of the pot (Figure 4). The smoke from the reduction chamber will enter the clay thereby creating deep shadowy crackles on the surface. The etching becomes a smoke drawing. We fire one piece at a time to about 1368°F (740°C) (Figure 5). The best indication of when to pull the pot out of the raku kiln is when the glaze matures to an “orange peel” look (Figure 6). There should be plenty of very rough texture all over the pot. Raku kilns heat up differently, clay bodies mature differently and the slip/glaze combo has variations. Firing 6 to 10 pots, one after another, will give you a good idea of how the kiln, glaze and ambient temperature are working together in the raku technique. Glaze and fire, glaze and fire, glaze and fire and keep a journal of it all. Remember, everyday, you are making history. We create a smoking chamber by digging in the ground and filling it with wood chips (Figure 7). Once the pot is removed from the kiln, it is cooled in the air outside the kiln for about 45 seconds. As soon as we hear the glaze crackling, it is time to place it in the smoking chamber and cover it with more wood chips. The hot piece is then covered completely with a metal container that allows the carbon to be trapped by the clay body (Figure 8). Fifteen minutes later the piece is cool enough to handle and is removed from the smoking chamber. A light spray of water is applied and the glaze falls off easily. Gentle rubbing with steel wool and water further cleans the piece and reveals the dark shadowy crackles and matte surface that is the signature look of the naked raku technique. At this point, we often apply thin washes of acrylic to enhance the imagery we have etched through the glaze (Figure 9). The thoughtful integration of form and surface guides us in our work. We use clay as a canvas. Balance is created by uniting the illusion of control, as evidenced by the etched imagery, with the mystery and random nature of the fire. Do you do any interesting variations on the raku technique? Share your ideas in the comments below! Add:, balance, bisque, bisque fire, body, brush, canvas, carbon, ceramics, chamber, clay, clay bodies, clay body, clay techniques, color, colored, cone 10, crackle, create, drawing, drawings, dry, earthenware, ferro frit 3110, fire glaze, fired pottery, firing, firing process, firing techniques, form, formula, frit 3110, gallery, gerstley borate, glaze, glazes, glazing, handle, heat, history, how to, ideas, imagery, kiln, kiln glaze, layers, leather hard, make, materials, matte, movement, naked raku, nature, pattern, pieces, pit, pit firing, porcelain, pot, pots, pottery, process, raku, raku fired pottery, raku glaze, raku glazes, raku kiln, raku technique, raw clay, reduction, resist, results, scratch, sculptural, set, share, size, slip, slip glaze, stoneware, surface, technique, techniques, texture, the raku, throw, throwing, throwing clay, time, tool, use, variations, washes, water, white stoneware, wood, working. This is wonderful, can’t wait to do some now. I am just learning about naked Raku and haven’t been able to get my head around it until now. Your step by step explanation is really clear. Finally, I think I understand it well enough to give it a go. Thank you. Hi Will, we have updated the images. We have updated the image orders and added Figure #’s to the article. We apologize for this oversight. Yes, I found this confusing, too. If the copy referred to “Photo #” that would have made this post easier to follow. Figures 3 and 4 should be switched. The rest are in order. It doesn’t appear that the pictures are in the correct order. They don’t match the sequence in the instructions. Hi Toby, we have switched from a slideshow to a gallery. Hopefully this helps! There is a pause button beneath each of the photo slideshows that will accomplish this for you. I find I am distracted from reding the copy in the article by the changing pictures. Can you please go back to pictures that stay stable that we can click on to change when we are ready to look at them? I would so appreciate it.